The climate disasters that made headlines in 2017 — monster hurricanes, devastating floods and unprecedented drought — will become commonplace in the coming decades as climate change intensifies. Decision-makers from urban planners to corporate executives are grappling with how best to adapt. Should city officials in the Caribbean update building codes to climate-proof infrastructure against storm surges, or move to higher ground? Should farmers in sub-Saharan Africa adopt more efficient irrigation, or switch to climate-resilient seeds? Getting comprehensive data is the first step in answering these questions. PREPdata, an open-source platform, helps users navigate credible, curated climate, physical and socioeconomic datasets. Users can easily map indicators like sea level rise or precipitation change to assess a specific region’s vulnerability, track datasets on customizable dashboards, and share their stories with adaptation practitioners. Precipitation and flooding risks are projected to increase across densely populated South Asia. In 2017, communities across South Asia braved one of the worst monsoon seasons in years. Torrential rains triggered landslides and flooding that killed more than 1,000 people and affected 41 million more in India, Bangladesh and Nepal. Looking out to 2050 and beyond, it’s clear that cumulative precipitation is expected to rise dramatically throughout the region, likely increasing the frequency and intensity of floods. 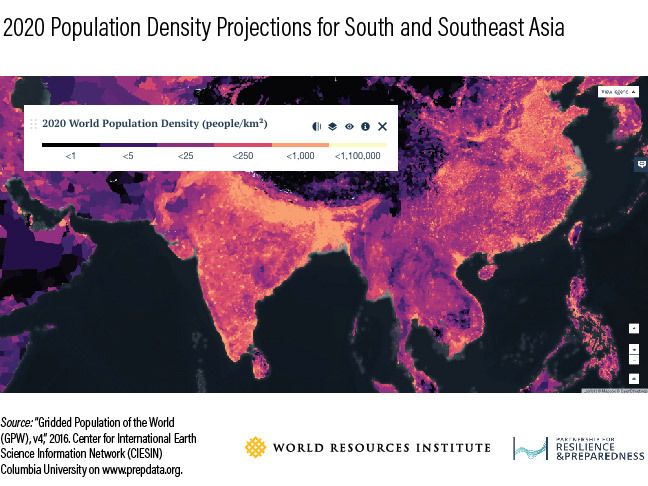 When pairing these projections with a map of population density, you can see just how many people may be exposed to catastrophic rainfall. With this data, policymakers can make more informed choices about preparing for climate disasters, from putting early warning systems in place to protect vulnerable communities to upgrading urban drainage systems to allow floodwaters to flow back into rivers and the ocean. Drought and dry spells threaten agriculture in Morocco and the Iberian Peninsula. 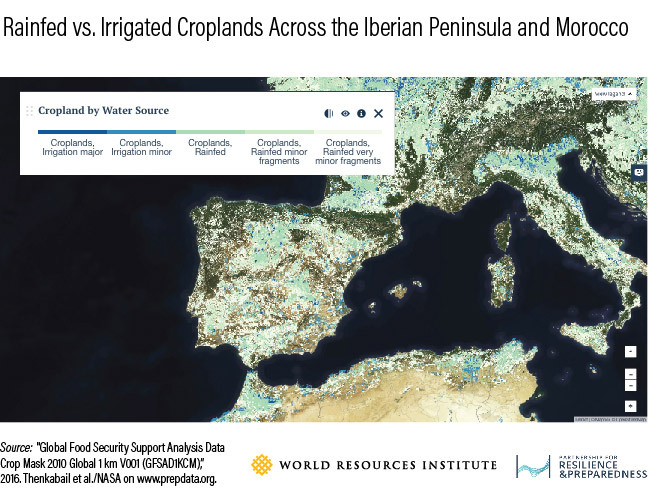 The Iberian Peninsula and its neighbor Morocco depend heavily on rainfall for agriculture, as shown below on a map of cropland by water source. Extended dry periods can drain available water resources to dangerously low levels, shrinking rivers and reservoirs that farmers use to irrigate their crops. Last year, for instance, a historic drought put tens of thousands of Moroccans out of work. Across the Mediterranean, Spaniards and the Portuguese are suffering from an extreme three-year drought, which has devastated the region’s olives, grains and grapes, and fueled deadly wildfires. As the map above illustrates, dry spells are projected to increase substantially across this region in the coming decades, threatening crops that depend on rainfall. Such information can help policymakers and farmers know how viable and vulnerable crops will be in the future. Increasing precipitation may trigger future landslides in western South America. An abnormally strong rainy season caused widespread flooding and deadly landslides in Peru and western South America in 2017, forcing thousands of people to evacuate and swallowing homes — in some cases, destroying entire villages. 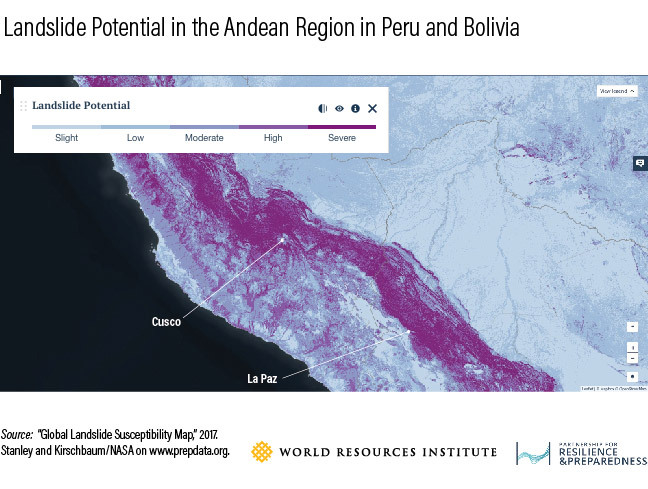 Cumulative precipitation is projected to rise in some parts of the Andean region, threatening highly populated cities like Cusco and La Paz, which are located in areas with severe landslide potential. 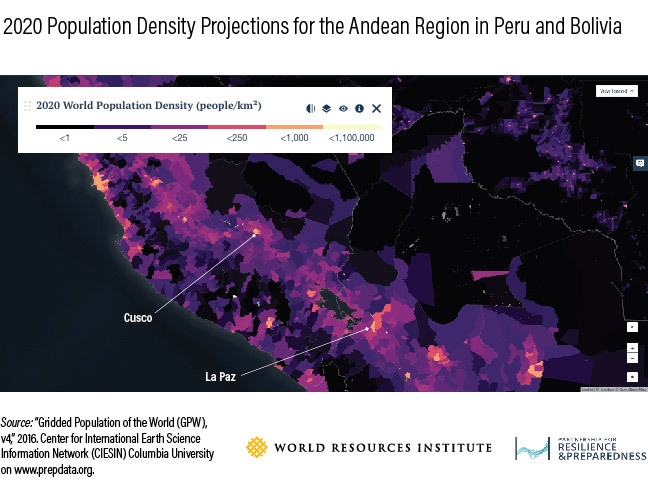 At the same time, more and more people are building houses in precarious areas of La Paz — near rivers, on cliffs, or at the foot of the mountains — without conducting feasibility studies. PREPdata can help inform vulnerability studies, allowing decision-makers, business leaders and planners to determine which regions are at higher risk of landslides and, if building is truly necessary, establish appropriate regulations. Sea level rise and coastal flooding are estimated to increase in the Southern United States. Still recovering from Hurricane Katrina, a Category 5 storm that broke levees and left neighborhoods submerged in toxic floodwaters, New Orleans and its surrounding low-lying areas now face a host of intensifying, climate-related risks: rising seas levels, increased flooding and stronger storm surges. The region is also gradually sinking. This leaves people and infrastructure vulnerable. For example, the map below shows which medical and emergency response facilities are at highest risk of inundation from storm surge. 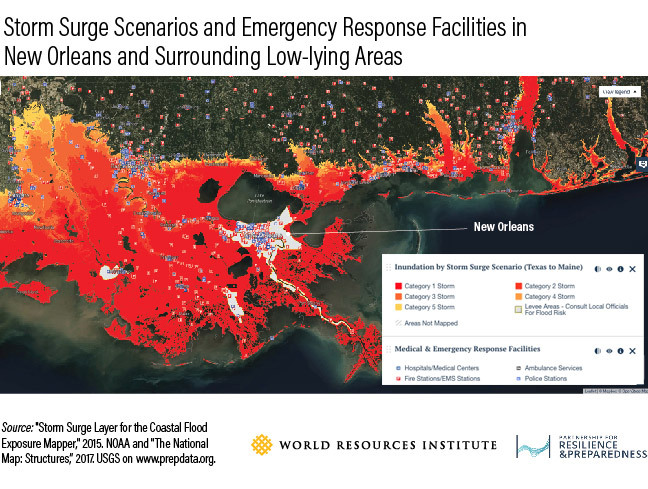 New Orleans launched its first resilience strategy in 2015, and officials are now prioritizing reducing flood risk and raising awareness across vulnerable neighborhoods. PREPdata can help visualize these risks under different storm scenarios and inform planning and community outreach. 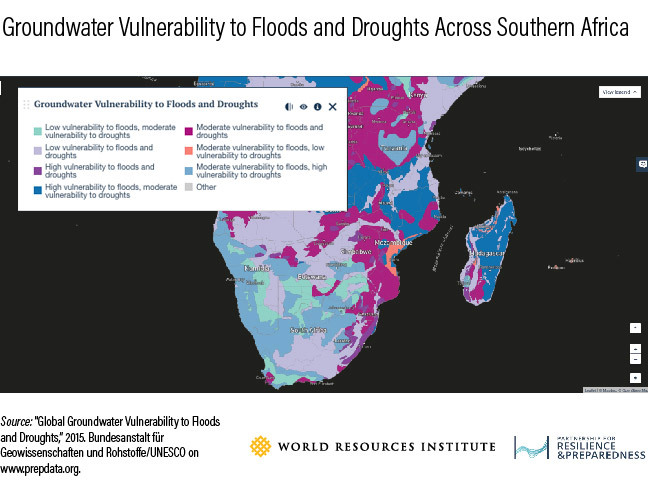 Unpredictable precipitation patterns fuel water risks in Southern Africa. Cape Town may become the world’s first major city to run dry. Its four million residents are fast approaching April 12th, also known as Day Zero, the day the city will be forced to turn off the taps. The precipitation map below shows how Cape Town is expected to face even less rainfall in the coming decades. The eastern coast of Madagascar and much of southern Africa will be similarly affected, meaning that the Cape Town scenario could play out in other cities and villages. Other parts of Africa, however, are going to see the opposite: an increase in overall precipitation. The map of groundwater vulnerability to floods and droughts adds another piece of the puzzle by revealing that the area’s underground water resources naturally face moderate to severe vulnerabilities to drought, potentially exacerbating current and future water crises. PREPdata could help decision-makers better manage scarce water resources in the continent, including the possibility of distributing water from areas that have more of it to those with greater scarcity. These stories and maps are just a taste of what users can do on PREPdata. In addition to finding location-specific data relevant to adaptation planning and resilience, users can also submit requests for datasets that they need or upload their own local datasets. Armed with the right information, decision-makers can start planning now for the climate of tomorrow.